Six days a week, the Streets get their hormone-free chickens—served roasted with black-eyed peas and a fresh-baked biscuit. At Gene Street's new venture, the birds live up to their lofty billing. Before I say anything else about Street’s Fine Chicken, I need to talk about the roast chicken. It nearly made me cry. Roast chicken is a simple thing, or it should be. This one, brined in sea salt and lemon juice and rubbed with herbes de Provence, had been given a final broil until its skin was drum-tight and thin like gold leaf, the fat rendered beautifully. I pierced through the burnished skin and released a sluice, juice spilling and pooling—and that flavor, distinctly chicken-y. Simple. Why, then, is it so maddeningly elusive? Rarely—and not until now in Dallas—have I tasted a bird that reminded me so much of home. By home, I mean France, where I spent my childhood and where the rooster is a national symbol. There, roast chicken is of almost devotional importance. Bresse is the only poultry with AOC status, the sort of distinction normally given to French wines and cheeses. These royal white beasts with blue legs hail from a specific region, everything about their pampered, pasture-raised, grub-eating lives vital and determinant, the very worms in the soil giving their meat distinction. 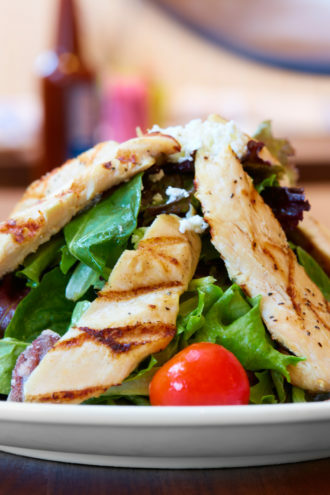 Hormone-free chicken atop the Hen House Salad with grape tomatoes and caramelized pecans—delivered from a tiny town near San Antonio. The three Streets behind Oak Lawn’s Street’s Fine Chicken—Marco and Mariel of Liberty Burger and Tony of Y.O. 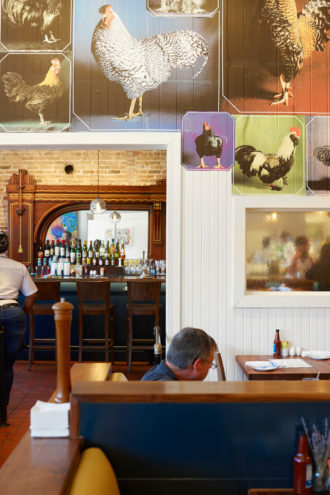 Ranch, the offspring and nephew, respectively, of iconic Dallas restaurateur Gene Street—know all about poulet de Bresse. They even bought some of the French chicks and raised their own flock on a friend’s farm in West Texas. While they didn’t pursue that route—they weren’t about to become full-time chicken farmers—the research itself says something. The chickens they’ve been serving since May are raised without stimulants or growth hormones in Nixon, a tiny town near San Antonio. Six days a week, they’re brought up from Nixon to a building long familiar to the Street family. The storefront on Cedar Springs was the site of Gene’s original Black-eyed Pea, opened with partner Phil Cobb in 1975 and finally closed earlier this year. The younger Streets have made it their own. Before entering, you may have noticed the murals siding the long brick wall, sly takes on classic paintings: Dali’s melting clocks reinterpreted as sunny-side-up eggs; American Gothic’s stony-faced couple recast as stern, feathered folk. The art is perfect in its slight irreverence, new icons for an old neighborhood. Marco collaborated on the mural’s design with four students from Booker T. Washington High School for the Visual and Performing Arts, his alma mater, and saw the work as a gift to the neighborhood they were re-entering. The interior is bright and modern. One wall holds portraits of chickens, regal beasts of different plumages, some coifed like manicured poodles, one’s feathery neck ruff elegant as any Elizabethan collar—all reminding you what strange, magnificent creatures chickens can be. A friend of the family is behind the abstract scatter paintings that look like Jackson Pollocks. A friend, that is, and his chickens: look closely, and you’ll see the imprint of chicken feet. Why order a sandwich—why order anything else, really—when you can have the roast chicken, with its glorious crisp skin, its juice that runneth over, and its jaunty sprig of thyme? The Streets have kept the bones of the old space—the tin ceiling, the long brick wall. When the booths fill and chatty families fill four-tops, it can be cacophonous in this now light and white room, with mustard-colored banquettes and egg-shaped salt and pepper shakers. It’s quieter at the bar, the same bar, with its wonderful wooden, art deco-style back bar that Gene Street bought at an auction in San Francisco in the ’70s. Another Black-eyed Pea standby remains. Veteran patrons come for the chicken-fried steak, here done more as homage, not as crispy as it could be (Street’s original recipe dictates it be griddled, not deep-fried) but good under a flavorfully seasoned crust. Aside from a few items—the chicken-fried steak; deviled eggs with a beehive hairdo of soft, whipped filling—the menu focuses almost exclusively on chicken, the object, for two years of research and development, of family fixation. In addition to roasting them, they serve their birds fried—bone-in breast and thigh under a well-seasoned shaggy golden coat—and in a preparation they call the Sin Killer. The latter is their take on piri piri chicken, a Portuguese via Africa dish that is often flame-grilled, with a ruddy marinade bright with lemon juice and fiery with African bird’s-eye chiles. Theirs is a paler version. The sauce, for all its citrus zest, is not entirely convincing in its incarnation as a syrupy glaze. These plates come with the usual salvo of sides. Black-eyed peas, cooked until tender and nicely flavored with cumin, tomato, and a little jalapeño heat; mashed potatoes under a mild cream gravy, the dome smooth as a baby’s knee; a refreshing coleslaw with jicama and green apple. Classic Pillsbury-style biscuits are pillowy in a comforting way, with craggy edges, the tops golden and anointed with honey. Sometimes they may be a little too doughy. But standards are done well. The interior of the restaurant is a shrine to the regal beasts. Beyond this, the menu is hit-and-miss. Brussels sprouts in a greasy and jammy bacon-maple sauce, thick with rendered bacon, seemed to want to pursue life as a bacon relish instead. Collards were tough; green beans floppy. Though the Brie in the pasta shells might—might—have been contributing a grace note of unctuousness, I was expecting more in the way of flavor. A fruit galette with a rustic crust would have been juicier had the fruit not been cut so thin, and bread pudding liberally studded with white chocolate and macadamia nuts might draw infelicitous comparisons to fruitcake, though no fruitcake I’ve known has basked in such a lovely pool of vanilla whiskey crème anglaise. Service reminds you of a neighborhood diner, a place that both attracts and caters to regulars: friendly, genuine, and unguarded. Servers made observations that made us laugh and feel good, not at all outclassed, as we ordered that $5 glass of bubbly. Nothing suggests Gallic snobbery. French touches seem more a way for the kitchen to have fun, for the place to be more than a joint with fried chicken. Ultimately, I would pose a version of the question that the chicken-fried-steak-craving regulars might. Why order a sandwich—why order anything else, really—when you can have the roast chicken, with its glorious crisp skin, its juice that runneth over, and its jaunty sprig of thyme?